I have been reading about Microsoft’s PivotViewer lately, and decided to try to get it going for myself. What is PivotViewer? Think of it as visual data slicing through a web page. What you do is take some data, and then tie records to images, and then publish out your “collection” and you can consume it via a webpage using the Silverlight PivotViewer control. One awesome example of this is here http://netflixpivot.cloudapp.net/. But what I have been really trying to wrap my head around is how to use the as a “business” tool. Because, it is easily technically doable, but you have to have a *reason* to do it. Working with widgets and customers and locations – what do you do? There are two things I could think of quickly. One – peruse your “master data” very fast and visually. The other is looking at some kind of metrics for your widgets, or logos of your customers you might sell too, or ? ..Well, you could..
Do the same as a master data catalog but allow filtering by some kind of metric. Shipped items over a given time or something. Anyways, the first thing you should do before anything is get some kind of data feed. Run a query, get some data from somewhere. Start small to test. 500-1000 records. Then the fun begins. Starting from absolute scratch..
Once you have that, there isn’t a ton you have to do to get things going with PivotViewer. Note, you have to make your web part of your project IIS based instead of the build in web browser. Why? Because the .cxml HAS to be hosted on a web server, it just works that way. You can use this to put some data in, you probably want to add more columns than what they give you by default. For my test I just used the same image for all records to get started. I have a feeling that the biggest barrier to entry to corporate BI teams and developers is going to be the imagery. You usually don’t have someone on your BI Team that knows how to use photoshop well and do all the high res imagery, so you are handcuffed there. For testing sake, I Published my collection to the root of my website, with the name “MyWidgets”. Now, if you think where you could take this. Each “image” is clickable and brings up the image right in front of you. You could have all the specs of that widget there, and a link to “buy”, or deeper analytics for that widget. Some other things I found out.. using the Excel tool for Pivot Collections is dog slow. Especially with a ton of records. It has to process the images for the “deep zoom” technology and it just takes a while. Like, hours. There are tons of possibilities here with PivotViewer, both for an external website and also internal corporate business intelligence. It will give people another way to delve into the data and turn it into information. Previous Post iPhone, AT&T, MMS Messaging Not Working? Nice, have the same problem with excel. Is there a faster way to process the images ?Vikram. 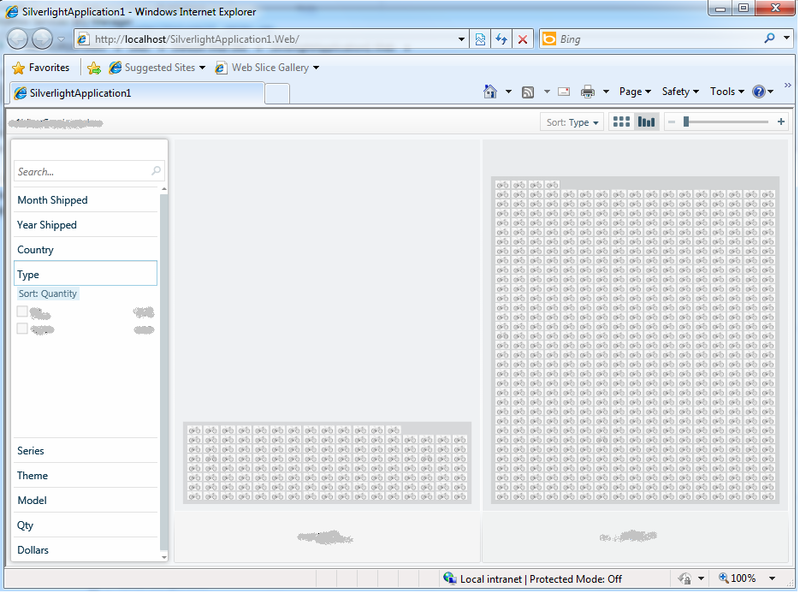 Is it possible to bind sql cube to silverlight pivotviewer control? is the IIS a hard requirement or will any web server work? Also what is the windows 7 dependency? We have windows xp at work and I would like to do some development there. I used the excel library zetexcel with success. it does not require to install Ms office.